Spring. For some of us, it feels like it has been years since we felt the sun’s delicious warmth on our skin, the simple joy of running out the door without thinking about gloves, hats or heavy winter coats or experienced the colorful symphony of flowers and plants wooing us with their natural beauty and fragrance. It seems that smiles get a little wider, laughter makes the air feel a little lighter and people start to come out of their shells like butterflies from graying cocoons. It’s a celebration of change in its purest form, of life being renewed — and there’s no reason this renewal shouldn’t include you. In a world of day-to-day grind, growing pressures and excessive stressors, who couldn’t use a chance to make things feel like new again. It’s easy to feel it when we’re outside in nature, experiencing the breezes, the flora and taking it all in from the back porch or our favorite park bench. But what about our lives indoors? What about when we walk in that front door after a long day, when we go to sleep and wake up in our beds morning after morning, night after night? If we could feel a sense of that renewal at those moments, each day would feel fresh, new and full of possibilities. One of my favorite parts of spring are the hundreds of plants and flowers that come up, treating us to myriads of colors, scents and species. Any debates on the world’s finest artist are immediately put to bed once we gaze upon the awe-inspiring work nature does during this time of year. Flowers and plants have the power to inspire, delight and fill us with joy. The sheer beauty alone can change our mood and perspective at any given moment. That’s why this time of year, I always find a new floral print to add to each of the bedrooms. It’s such a small thing to do but this small thing makes me feel like I’m strolling through a virtual garden as I move around my home. 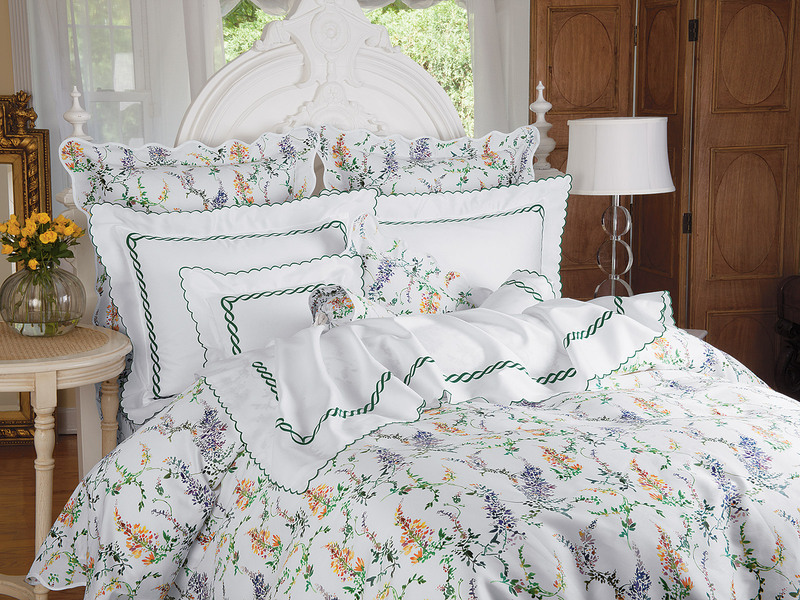 With the right prints and high-quality embroidery, the flowers on my bedding are so vivid I can almost smell them. Long stalks of leafy, graceful greens, fresh bursting purples and pinks, whites and violets, create an environment of optimism each time I enter. In a way, I’m bringing in that feeling of spring renewal into my everyday routine. I feel more peaceful and content when I lay down to sleep or sit in bed reading. I wake up feeling more positive, revived and refreshed to start the day. My perspective starts to change in the best of ways — and that’s so important. Because how we look at something, whatever it is, goes a long way into determining how we approach it. Waking up and sleeping in a negative, dreary environment will have a negative affect on your psyche. And it’s been proven time and time again that we do indeed have a psychological reaction to color, shapes and other visual cues. By putting yourself in the best possible environment, you’re producing the best possible “you” each day. 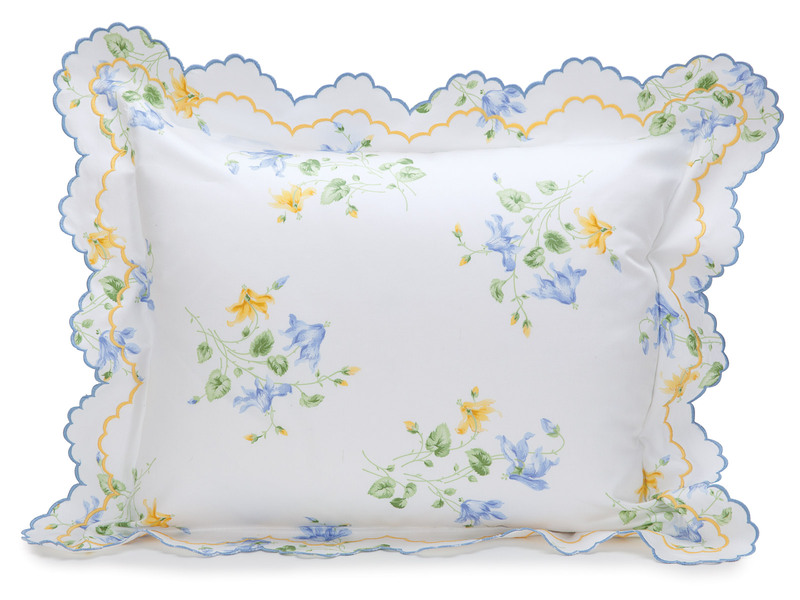 Those of us who suffer from seasonal allergies may find an even greater appreciation for beautiful floral-styled bedding this time of year, as certain sensitivities can make it difficult to wallow in the flowers. 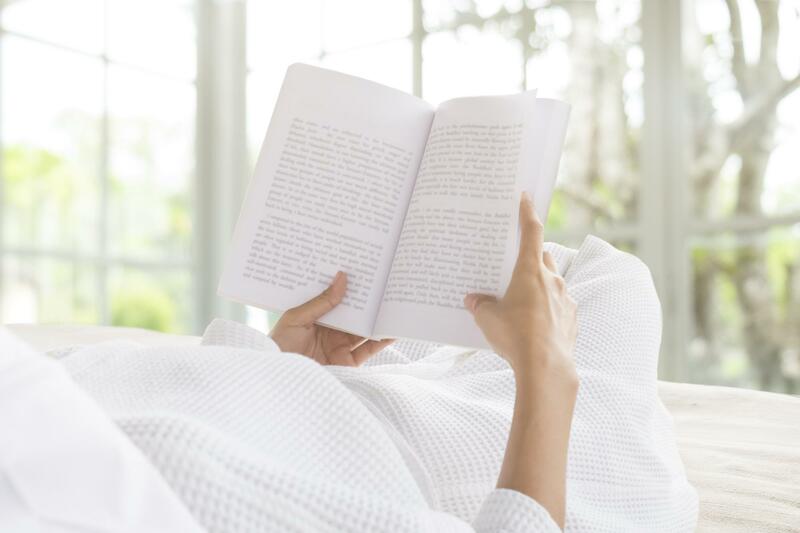 When my allergies are being particularly pesky and I can’t get my fill of that gorgeous flora outside, I simply get home, grab a book, a magazine or a loved one and immerse myself in a calm, refreshing environment that makes me happy, not sneezy. Springtime is also about a renewal of comfort. Heavy comforters can be replaced with lighter, cooler fabrics that feel delicious on bare skin and let those nightly breezes come through like dreamy kisses from the sky itself. Switching over from winter bedding to spring-inspired will take your sleep to another level. You’ll sleep better, feel more energetic in the morning and overall the time you spend in bed will be that much more enjoyable. And because we spend so much time there, we should do everything in our power to make it as beneficial as we can. Once you’ve decided to start your renewal, you won’t have a hard time finding plenty of options. There are a multitude of floral designs to choose from, including flourishing sets like San Remo, Pansies, Country Garden and a variety of other designs that will instantly add beauty and charm to your home. Plus, these sets are designed to be mixed and matched so you can easily create a look and feel that fits your personal tastes perfectly. If flowers aren’t your thing, you’ll also find hundreds of other patterns and styles that will satisfy any of your interior design cravings. Exclusively original prints from classic to contemporary, all meticulously crafted by experts and made using the highest quality materials at an affordable cost. Because we believe everyone should have the chance to find joy in every day. Spring renewal starts with that very first bud pushing up with all its might from a semi-frozen ground, fighting for its chance to thrive and become the very best it can be. Ask yourself if its time you started pushing through all the barriers keeping you from a life full of total happiness and contentment.